It is no secret that investment guru Warren Buffett has taken a liking to the insurance business, with his first foray in the industry with the purchase of National Indemnity Company in 1967, before Berkshire Hathaway’s acquisition of GEICO, the second largest auto insurer in the US, by 1996. Buffett’s fancy for the insurance business can actually be simply explained by – “float”. When an insurance company collects premiums through assuming risks for its customers, net premiums which are not paid out in claims is called the float, and the company is free to use the float to earn investment income. 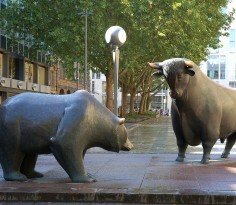 In essence, it is similar to having a source of interest free loan for investments and acquisitions. Hence, we take a closer look at Great Eastern Holdings (GEH), one of the insurance providers listed on the Singapore Exchange, for possible investment opportunities. 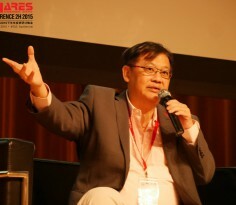 Ever since the Monetary Authority of Singapore (MAS) liberalised the insurance industry in 2000 by lifting the closed-door policy on direct insurers and the 49 percent foreign shareholding limit in locally-owned direct insurers, Singapore has come a long way to become today’s vibrant and competitive regional insurance hub. 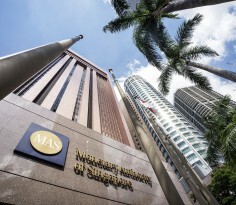 In recent years, MAS’s efforts to focus on consumers’ interest and recommendations from the Financial Advisory Industry Review – a comprehensive evaluation of the financial advisory industry – has led to the implementation of several “disruptive” initiatives in year 2015. 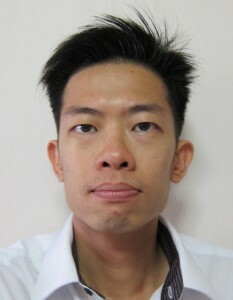 These include setting up of CompareFIRST, a web portal which allows consumers to compare insurance products online, as well as launching of Direct Purchase Insurance (DPI) which refers to a class of simple life insurance products that can be sold with lower premium but without financial advice. Nevertheless, the impact to overall premium growth is less than significant. 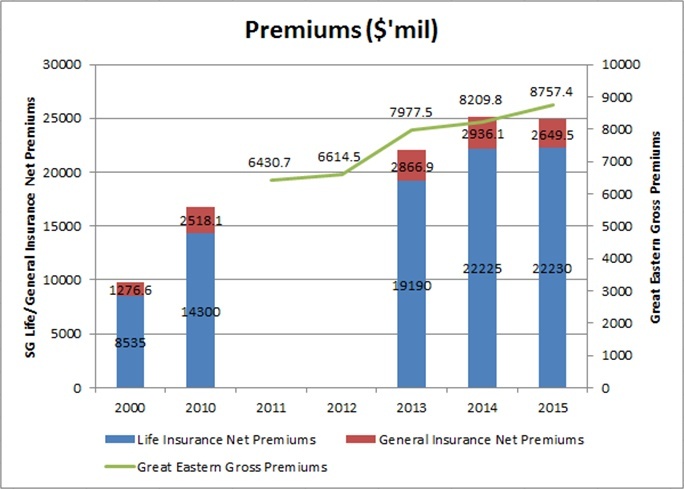 According to statistics on the insurance industry published by the MAS, net premiums for both General and Life Insurance has been on the rise over the years. Similarly, GEH has also managed to achieve continuous growth in its gross premium for the past five years, with a compounded annual growth rate of 8 percent from 2011 to 2015. GEH is one of the oldest life assurance company based in Singapore and founded in 1908, with operations primarily in Singapore, Malaysia and Indonesia. It offers both life and general insurance solutions, as well as fund management services. GEH has a market capitalisation of around $9.7 billion, and is 87.6 percent-owned by Oversea-Chinese Banking Corporation (OCBC) as of December 2015. 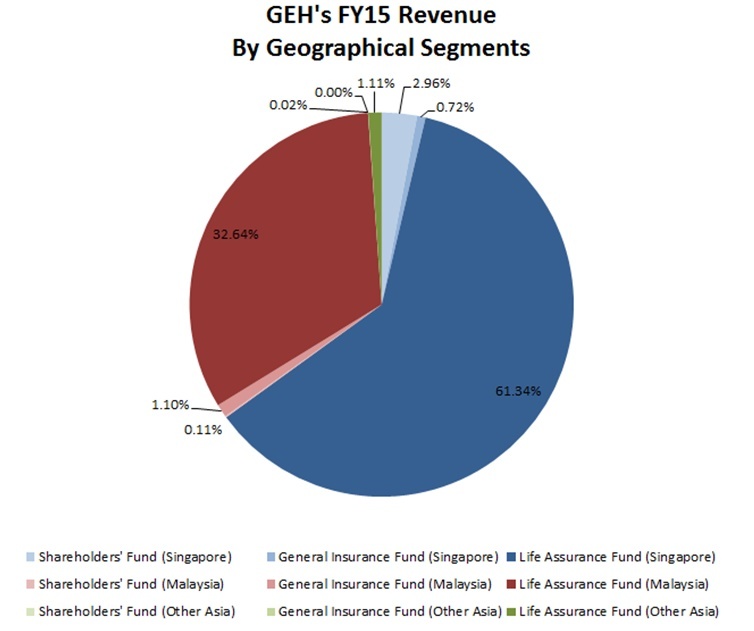 As an established insurance provider with a well-recognised brand among Singaporeans, GEH has been able to generate positive cash flow from its operations consistently over the last five years (except in FY12 in which it recorded a negative cash flow from operations attributable to net outflow of cash used in the settlement of investment trades). These sources of cash flow allow GEH to accumulate cash and strengthen its balance sheet. It is worthy to note that as of 30 September 2016, GEH held $3.3 billion of cash and cash equivalents with only $400 million of debt issued, giving it a net cash position of around $2.9 billion which accounts for around 29.4 percent of its market capitalisation. On a per share basis, GEH has net cash per share of around $6.06. We have identified three key factors which may potentially drive GEH’s continuous growth, namely its competitive advantage as OCBC’s subsidiary, Singapore’s ageing population as well as rising affluence of emerging markets’ middle class. Being part of the OCBC group, GEH is able to draw on the bank’s vast customer base providing them with tailored products. Moreover, tapping on OCBC Bank’s market leadership position in Small and Medium Enterprises banking, GEH has launched a suite of group insurance policies specifically customized to these corporate clients. Through leveraging on the collaboration and synergies between both groups, GEH possesses a slight advantage over its peers by having the opportunity to venture into targeted markets which are otherwise unavailable to other competitors. 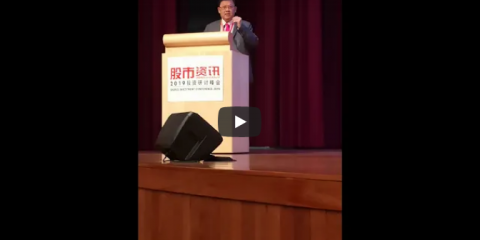 Speaking at the seventh annual Ho Rih Kwa lecture organized by the Singapore Management University in June 2015, Prime Minister Lee Hsien Loong commented that the number of citizens aged 65 and above is increasing rapidly, doubling from 220,000 to 440,000 in 2015, and is expected to increase to 900,000 by 2030. From GEH’s FY15 annual report, GEH’s revenue from Singapore accounts for around 65 percent of its FY15 revenue. Given GEH’s strong performing distributing channels and ever-expanding product suite in the Singapore market, it is well-positioned to capitalise on the prominent trend of Singapore’s ageing population. Last but not least, GEH is also embarking on initiatives to foray into emerging markets comprising Malaysia, Indonesia, Vietnam and Brunei. The group is optimistic on the long-term prospects for the insurance business in Southeast Asia, on the back of its population of 600 million, growing middle class and rising affluence. As the middle class population in these areas becomes more risk-conscious with increasing financial literacy and coupled with a higher disposable income, demand for insurance products to mitigate their risk exposure will climb in tandem. Based on GEH’s closing price at $20.58 as of 31 January 2017, it is currently trading at a price-to-earnings (P/E) ratio of 12.4 times. We deem GEH to be slightly under-valued, considering its market leader position in Singapore and in comparison to the industry average P/E ratio of 15.6 times. However, despite GEH being able to register increasing gross premiums year after year, the profit and loss which it reports every year is actually very much dependent on the economic conditions and its funds’ performance. Hence, its net profit attributable to shareholders could be inconsistent subjected to market’s volatility and uncertainties. Nevertheless, given GEH’s strong financial position and positive drivers for growth, we are convinced that it could be a potential candidate for investment over the long term.